The small original church looks C12, but the nave foundations may be pre-Conquest; it was mostly rebuilt in 1890. To the north, a larger church was added in 1960-61. 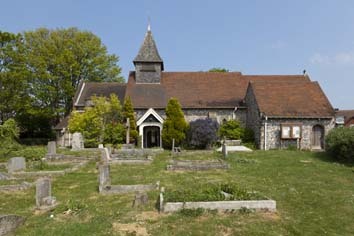 West Blatchington is on the Downs; by 1428 the church was in decay (SAC 111 p76). No rector resided from the mid-C16 (4 p166) and in 1686 it was described as ‘wholly ruinate’ (SRS 78 p34). Subsequently, the living was united with Brighton (3 p4). These statements taken together cast considerable doubt on Hussey’s claim (p201) that the church was still ‘entire’ in 1724. Virtually the only substantial building in the parish was the combined windmill and barn, which still stands near the church and which, perhaps not entirely co-incidentally, date from 1724. The small church was in use as a henhouse (1 p246) when reconstructed in 1890, at a time when the population was barely 100. In 1928 the parish was divided between those of Brighton and Hove and only reinstated in 1940 (Dale p222), following the residential development of the area. Though a single space today, stones found in 1890 including billetwork and preserved in the church were interpreted as part of a roll-moulded chancel arch (1 p247) which would have been C12. These were set in the north wall but are no longer to be seen, possibly as a consequence of the extension of 1960-61 (see below). Two small round-headed windows in the west wall remain and would be consistent with such a dating, but excavation of the foundations of a rectangular extension west of the nave suggests this may have been pre-Conquest. Its doorway has through-stones and the walls are about 2ft 6in thick (2 p80), both often seen as indicators of early date. The walls were traced under the C12 nave, probably as far as the presumed chancel arch. The south wall could in part belong to this structure, for above the present south doorway are traces of a round-headed window and there were others before 1890. It is a puzzle why the church was truncated at the west end whilst a chancel was added to the east. In the C14, the chancel was remodelled with a square-headed east window, seen on the Burrell Collection drawing (1782) and the chancel arch may have been removed then. In 1890 foundations of what appeared to be a south chapel were found, probably entered from the church by an arch visible on the Sharpe Collection drawing (1802), but no longer. The plain four-centred south west doorway looks C16. In 1855 H M Wagner planned a new church by G F Bodley on a different site (Dale p220) and one, proposed for this one in 1874 would have entailed replacing all existing walls (BN 24 p231). However, reconstruction by Somers Clarke junior (BN 57 p471) started only after a bequest in 1888. He created a single space with a new reticulated east window (a few stones of the sill are said by Meads to be old, but this is hard to discern), other windows in a related style and a south porch. The roof, shingled belfry and spirelet are all his work. The existing walls were re-used where possible, but most were so fragile that they were refaced and buttressed. By the mid-C20 the church was inadequate for the many houses that had been built nearby starting in the 1920s and in 1960-61 J L Denman removed the north wall and added a larger and slightly taller church (BAL/MSS 41218), which lacks a tower. There is no detailed record of the wall that was removed, though according to Meads all the windows were modern. The C15 style south west window, taken from it, is at best renewed. Denman used flint as in the old work, with bands and dressings of brick. At the west end, two semi-circular bay windows, of a type much favoured by Denman, flank the west doorway; the other windows are similarly unecclesiastical. There are ingenious skylights above the arches between the old and new parts, which light both parts. 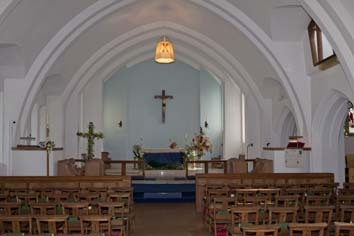 The proportions of the new part are broad and low, with transverse arches springing low down and the altar is lit from the sides. There was further work in 1987, when the porch was restored (EH). Font: Small and circular. It probably dates from 1890. 1. (South nave, first window) C E Kempe, 1890. 2. (East window of old church) Burlison and Grylls (Clarke papers). 3. 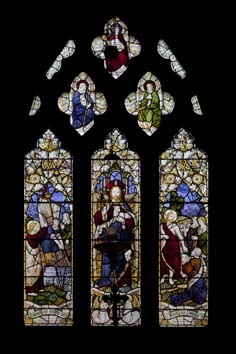 (Two-light window, originally in old church and now at the west end of the new one) E Woore, 1935 (DSGW 1939). Piscina: (Old church) Plain and pointed, it is probably C14. Sedile: (Old church) Also plain and probably C14.